Need an idea for groom and groomsmen gifts? There’s nothing like coming home from a long day at work to a box by your front door! I dropped everything and rushed for scissors to cut open the package. To my excitement, it was the personalized shot glass set I ordered from Groovy Guy Gifts. My first impression was “Wow!” The beautiful old-fashion box, engraved with my name, housed the pair of shiny shot glasses. Each shot glass was engraved, and the customization was clean and smooth. I can’t wait to fill them up with my favorite whiskey. I ordered this shot glass set for myself, but it would make a perfect birthday or holiday gift for any guy in your life. I work in the wedding industry and often the groom is overlooked when it comes to gifts. This set would make an ideal gift for a groom or personalize them for his groomsmen. 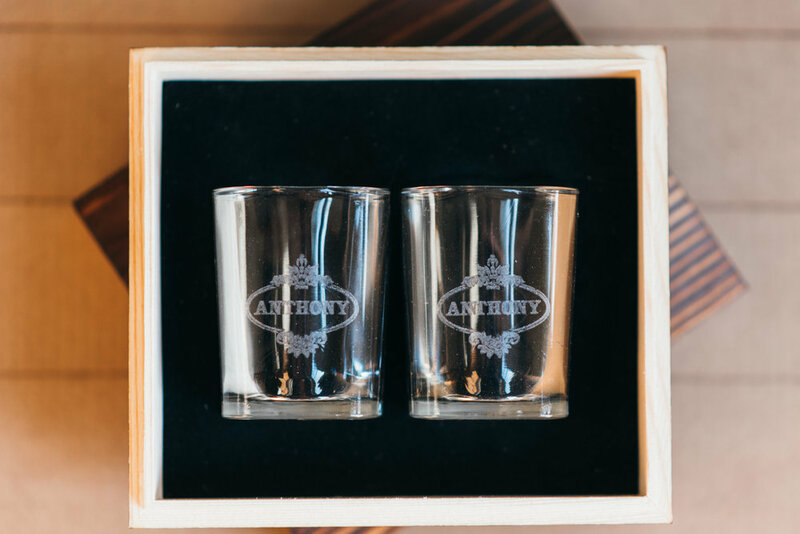 Engrave these shot glasses with the special date, and the memories of the day will reappear each time they are used. Each shot glass holds 2 ounces, and the rustic stained box is 5”x5.5”x2.5”. Each glass can be personalized with 2 lines of up to 10 characters per line. The wood box can be engraved with 1 line of up to 10 characters. These shot glasses are the perfect serving size for shots and can also be great for portioning out as you create fun mixed drinks. This way you can maximize your stock and never over pour. The design of the glasses has commercial use in mind, making them ideal for a Man Cave. Invite your buddies over time and again for a good time with these personalized gems. I found this box set on Groovy Guy Gifts, an online store for unique personalized gifts for men. They have several great gift ideas for any type of guy in your life. As I browsed the site I thought of how I could buy for my husband, dad, brother, and boss all in one shot! There is a wide variety of interesting ideas for personalized groomsmen gifts that can be found within the site as well. Go take a look for yourself!